Stand out at your next trade show or event with retractable banners from SIGNARAMA! Our retractable banner stands are an easy, cost-effective promotional solution. All of our retractable banner displays are constructed in eco-friendly facilities and are even recyclable once they've reached the end of their long life. SIGNARAMA offers several banner stand models in both standard and economy categories to suit your needs and wallet! Typically most of these stands are made for indoor use, but could be used for short term outdoor use, but this is not recommended. Our standard family of retractable banners is a group of high-quality, rigid retractable banner stands made in the USA from the finest materials. These retractable banners feature molded end plates and a three-piece bungee corded pole. Our standard models stand 83.25 inches tall and are available in widths of 31.5 inches, 35.5 inches, and 39.25 inches. Double-sided retractable banner displays are also available. 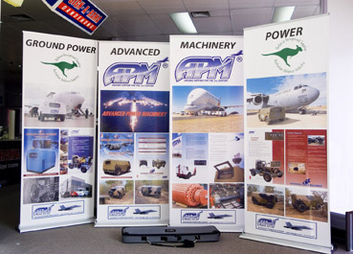 Our economy line of retractable banner stands are a low-cost alternative to our standard roll up banner stands. SIGNARAMA's economy models are functional and reliable, but use lighter weight materials and simpler construction to save you money. These portable banner stands are produced by a handful of independent retractable banner and display producers from all across Asia. Two economy models are available to fit your needs and your budget: our single-sided model measures 31 inches wide and 77.5 inches tall, while our double-sided retractable banner is 32.75 inches wide and 78.25 inches tall. Retractable Banner Stand displays provided by SIGNARAMA are the easiest and most portable of all our pop up style displays. SIGNARAMA can provide single sided and double sided Retractable Banner Stands with the great benefit of easy storage and quick set up. Retractable banner stands can be used for trade shows, presentations, and sales meetings or in you local chamber of commerce events. SIGNARAMA can provide full digital printing for your banner display stand. Another great benefit of the Retractable Banner Stand is when you need to change to a different design you can replace the design without having to buy a second banner stand. Just bring your existing Retractable Banner Stand to your local SIGNARAMA and have our team of designers make you a new banner to use with the existing stand. Typical turn around time is 5 - 7 days for these display type stands. If you find yourself in a jam, and have an upcoming trade show booth that is missing a display, give SIGNARAMA a call and we will work to provide you with a sign in time for your trade show. SIGNARAMA finds that many business customers can benefit from having a Retractable Banner Stand as part of their marketing supplies. Easily have your message at any event for all your customers to see. Compared to other display products the Retractable Banner stand is the easiest to use, quickest to set up and take down, and simplest to store.